Robot control is the backbone of robotics, an essential discipline in the maintenance of high quality and productivity in modern industry. The most common method of control for industrial robotic manipulators relies on the measurement and amendment of joint displacement: so-called "joint-space control." 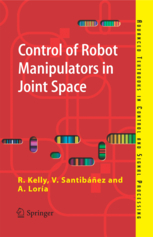 Control of Robot Manipulators in Joint Space addresses robot control in depth, treating a range of model-based controllers in detail: proportional derivative; proportional integral derivative; computed torque and some adaptive variants. Using varying combinations of the textbs four parts: b" robot dynamics and mathematical preliminaries; b" set-point model-based control; b" tracking model-based control; and b" adaptive and velocity-independent control a complete course in robot control based on joint space can be constructed for senior undergraduates or masters students. Other areas of study important to robotics, such as kinematics, receive attention within the case studies which are based around a 2-degrees-of-freedom planar articulated arm termed the Pelican prototype and used throughout to test the examined controllers by experimentation. In addition to the written text, auxiliary resources are available in the form of pdf projector presentations for the instructor to use in lectures and as printed class aids for students, and a pdf solutions manual. All of this labour-saving supplementary material can be downloaded from the Springer website.